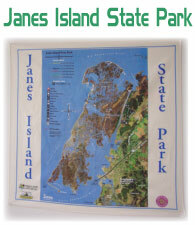 This 100% cotton bandana covers the overall Janes Island State Park with a unique aerial photo background. Kayakers find their way through the marshes easily and love it to protect themselves from the sun. DNR Bandana maps are 21" X 21" in size and made of 100% cotton.